I know about IQ and EQ, but now there’s also Creative IQ. 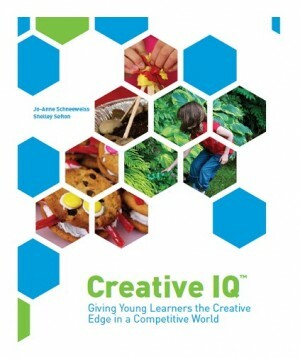 In their new book by the same name, authors Jo-Anne Schneeweiss and Shelley Sefton, write about “giving young learners the creative edge in a competitive world.” Written for parents and teachers, this book is certainly a creative endeavour. Practising what they preach, I can imagine the hundreds of hours that went into conjuring up creative exercises and text in colourful, easy to follow detail. The book itself is clearly laid out and well organized, making it easy to navigate. Along with the smorgasbord of tasks in the form of recipes, word searches, word jumbles and more, there is consistency throughout. Each chapter begins with a colour coded intro and ‘creative IQ goal,’ and contains more colour coded descriptive boxes with challenges and details about the ‘building blocks for creativity’ that are being cultivated by engaging in the activities. So, if you flip through the book looking for all the ‘challenges’, for example, you will easily spot them in the blue boxes throughout. And if that isn’t good enough, the authors have made it even easier. They’ve grouped all the activities that work towards developing a specific skill and placed them under one of 37 skill developing headings at the back of the book. So, if you feel that your child needs to work on observation or organizational skills, for example, you can flip to page 152, find the skill heading, see which activities will aid in his or her ability to build on this skills and turn to those activities in particular. Or if you feel that your child would benefit from partaking in all activities to enrich his overall creative IQ, you may want to work through the book – cover to cover. As a parent and parent educator, I enjoyed flipping through the entire book and chuckled over the authors’ clever and creative use of words for section headings and throughout – “Can you run berry fast?” and “fruit apeels in many ways” in their Fruits are Fun chapter, for example. I wouldn’t hesitate in recommending this book to parents and educators as a guide towards helping children develop important skills through play.